At Saratoga Periodontics, our mission is to deliver the highest level of periodontal and implant therapy in an effective, efficient and caring environment. Welcome to the office of Saratoga Periodontics. Congratulations on taking this first step toward better health. 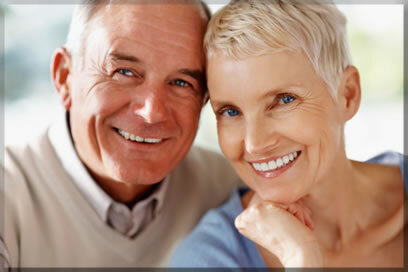 On our website, you will find information about various periodontal conditions as well as dental implants. You will also find specific information about our practice, the treatment options we provide and how we will work with you and your dentist to achieve a healthy and long lasting smile. Periodontics involves the treatment of the supporting structures of the teeth, including the bone that supports the teeth and the gums that protect the bone. Treatment can be done to arrest disease, improve esthetics and replace missing teeth. Left untreated, periodontal problems can lead to red, swollen gums, loosening teeth and eventual tooth loss. Doctors Steven H. Dweck and Katherine Guilfoyle specialize in the art and science of creating healthy smiles through the treatment of these periodontal problems. Our practice offers the treatment of gum disease, placement of dental implants and cosmetic periodontal surgery. We look forward to meeting you and reviewing your specific periodontal needs. We will present the best plan of treatment for your situation and provide information that helps you to make more informed decisions about your oral health care. Our staff of professionals will help make your visits with us as comfortable and pleasant as possible. Our entire team is dedicated to providing you with the personalized, gentle care that you deserve. More than 500 medications can contribute to oral dryness, including antihistamines (for allergy or asthma), antihypertensive medications (for blood pressure), decongestants, pain medications, diuretics and antidepressants. Maintaining healthy teeth and gums may reduce risk for pneumonia, chronic obstructive pulmonary disease. The prevalence of periodontal disease in the United States may be significantly higher than originally estimated. Clinical recommendations encourage cardiologists to examine the mouth and periodontists to ask questions about heart health. A study suggests that antioxidants in green tea may help reduce periodontal disease.